I love that all three of these wonderful stories are now combined into one book! I have already read two of the books so it was a pleasure to read More than a Promise. I've left the links to my review of the other two books and my new review is at the bottom. Tess Smiley is new to Wells Landing and newly married. But her marriage isn’t the harmonious union she envisioned. Tess loves Jacob with all her heart, but her heart tells her she must take a stand—and ask for support. Only then does Jacob see how he has hurt her. But is he too late? . Mariana Miller prayed for a child throughout fifteen years of marriage. But now, newly widowed, Mariana discovers she’s pregnant—with twins! She’s more grateful than ever for her caring community—especially Reuben Weisel, her late husband’s business partner and best friend. Reuben’s quiet strength comforts her—until he proposes marriage . 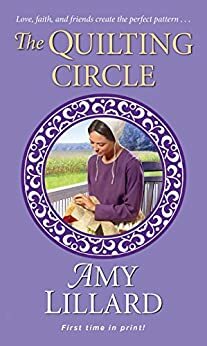 Amy Lillard takes us back again to Quilting bee of Wells Landing in More Than a Promise. The focus in this book is on Mariana and I grew to love reading about her. Page after page it drew me into her life and situation. She was blessed when the quilting bee heard about her need and rallied around her. Don't get me wrong, she was strong but we all need help at different times in our lives. Reuben comes in to the story and muddles the waters with his helpful nature. I admired him for his hard work and never give up attitude. The situation and the suspense of the romance made this a great read! I received a copy of this book from the author. I was not required to write a positive review. All opinions expressed here are my own.